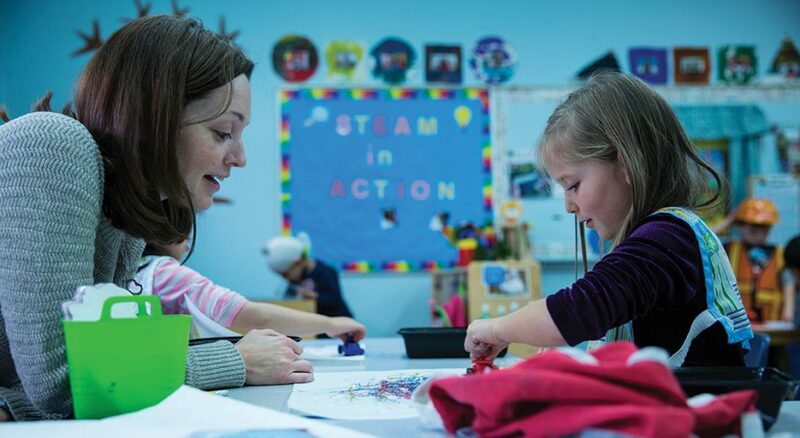 Tracey Conrad, a teacher at First Lutheran Preschool, Ellicott City, Md., works with a student during her STEAM class. Photo by Will Nunnally. A First Lutheran student draws a blueprint for a house during a construction unit. Photo by Will Nunnally. A student practices hammering during the construction unit. Photo by Will Nunnally. Blueprints were strewn hastily over a tabletop. A truck putt-putt-putted its way across the carpet squares. Little orange hard hats circled a room filled with the cacophony of a construction zone. 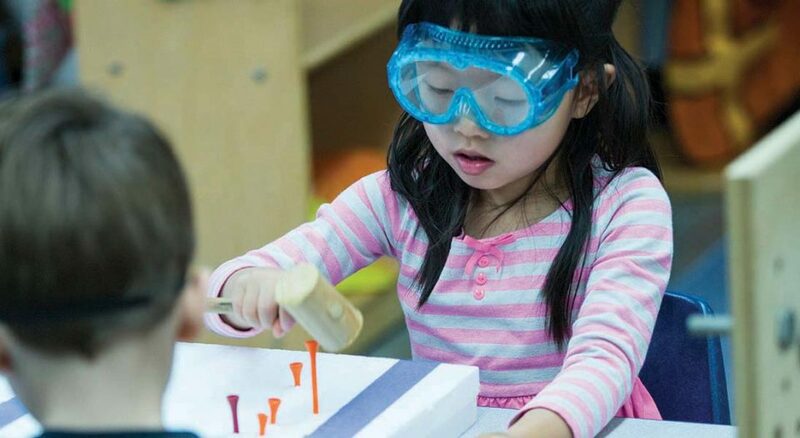 It was afternoon at First Lutheran Preschool in Ellicott City, Md., and its 4- and 5-year-olds were laying the foundation for a new unit on construction in their STEAM (science, technology, engineering, arts and math) class. The preschool started offering a STEAM class in 2012 when its board was brainstorming ideas for filling an afternoon class. On a whim, someone suggested a STEM (science, technology, engineering and math) class, as the buzzword was circulating in the education community—though few envisioned it as something meant for preschoolers. How could they incorporate the engineering design process into snack time? As it turned out, apple juice and orange slices were ripe for a little experimentation. “The more we thought about it and the more we researched how to do it in a developmentally appropriate way, [the new class] really started to become exciting to us,” said Jenny James, preschool director. The board decided to add arts to the curriculum as well. STEAM stands for science, technology, engineering, arts and math. Adding the arts to the STEM fields is trending in education, as it can make scientific content more accessible and encourages creativity—an important component of the design process. On its own, the scientific method provides the framework, but not always the imagination, necessary for discovery. Located about 25 minutes outside of Baltimore, Ellicott City is situated near many research universities and government agencies. When James and the board began planning the STEAM program, they were able to mine their home congregation, First Evangelical Lutheran—which includes several college professors and subject-matter experts—for ideas. “Our strength has been because we have [reached] out to the whole congregation,” said former preschool board member and professor LeaAnn Christenson. The effect, said Michael Louia, a pastor of First, was a growing outreach ministry that built connections in the pews as well as the community. The class teaches STEAM in monthly units and incorporates a variety of educational approaches, such as Montessori and Reggio Emilia. The primary focus is self-directed learning and teaching students how to research and work in groups. Tracey Conrad has led class for two years and feels STEAM is easy to incorporate into her lessons. “Teaching STEAM isn’t as hard as everyone thinks it is with the little ones because they’re just so curious it kind of lends itself to the natural curiosity,” she said. While love of school is a central component of what preschool staff try to instill in children, they are also aware of their goals as an outreach ministry of the congregation. The school shares with students and families what it means to be Lutheran through activities like chapel and prayer. Louia agreed, noting that First and its preschool are located in a multicultural neighborhood that is rich with opportunity for evangelism. Will Nunnally is a video producer and photographer for Living Lutheran. He lives in Chicago with his wife Eunice.